One of the least star-studded Italian squads in living memory, a reflection perhaps of Serie A’s reduced status. That leaves the superannuated Andrea Pirlo, even at a stately 35, as their top draw. Despite his advancing years, there are few better conductors in the game than the Juventus playmaker. There are younger legs and livelier talents in this squad but for one last time at a major tournament just sit back and savour each and every perfectly-placed pass from Andrea Pirlo. Mario”Why Always Me? Balotelli. Why? Lets not ruin the surprise. Cesare Prandelli has rejected the stereotypes and turned into a stylish attacking side. He has held on to at least one Italian tradition however: there will not be a better-groomed manager at this World Cup. Italy love nothing more than annoying France, from Marco Materazzi’s masterclass in the 2006 final, all the way to 1938 when the team were sent out to play in black shirts, a strip with clear fascist overtones sported purely to annoy the Parisian crowd. Does it really matter? They are there. They are always there. OK then, they strolled their group finishing six points clear of Denmark in second place. England can never forget 1966, but most Italians probably can’t even name the four, yes four, times they have won the World Cup. The 2006 victory stands out as a triumph against the odds played out to a backdrop of scandal and controversy. Defeat on penalties to Argentina on home soil in the 1990 semi-final. No one in England, though Liverpool fans might recall Alberto Aquilani. Solid defence, counter attack, slow starters, tournament know-how, lavish gestures, long hair. Free (ish) flowing attacking football, dodgy defence, lavish gestures, long hair. The Italians, as always, are at their best when sitting back patiently and waiting for teams to make mistakes, or pass themselves out, before hitting them on the counter. Think José Mourinho’s Chelsea, only with more expensive cologne. Balotelli’s evisceration of Germany in Euro 2012 stands as the recent high point, though Italy held their own against world and European champions Spain at the Confederations Cup, before doing what they so often do, losing a penalty shootout. Prandelli says he has been drilling his team to line up 4-3-1-2 or 3-5-2 because he has to “organise how to get to the final”. How’s that for ambition, Roy? We were for centuries downtrodden and derided, we are not one people, we are divided. One minute 40 seconds of chest-pumping national pride. Note to any budding young countries out there: this is how you do a national anthem. It’s almost impossible for an outsider to look like an Italian man or woman so instead try and behave like them, which basically involves overreacting to every single incident waving your hands in the air and looking to the heavens in disgust. 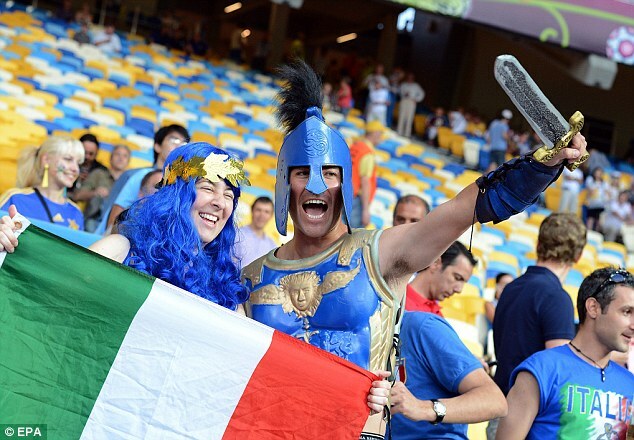 Only Brazil (93) and Germany (99) have played more games in World Cup finals than Italy (83). The Italians have drawn more games than anyone else (21). This entry was posted in First Group Games, Group D, Groups, Italy, Teams, World Cup Build Up and tagged Italy, World Cup, World Cup 2014 by dizzleolizzle. Bookmark the permalink.